Remembrance Day. At 11 am on 11 November 1918 the guns of the Western Front fell silent after more than four years continuous warfare. The allied armies had driven the German invaders back, having inflicted heavy defeats upon them over the preceding four months. In November the Germans called for an armistice (suspension of fighting) in order to secure a peace settlement. They accepted the allied terms of unconditional surrender. The 11th hour of the 11th day of the 11th month attained a special significance in the post-war years. The moment when hostilities ceased on the Western Front became universally associated with the remembrance of those who had died in the war. This first modern world conflict had brought about the mobilisation of over 70 million people and left between 9 and 13 million dead, perhaps as many as one-third of them with no known grave. The allied nations chose this day and time for the commemoration of their war dead. On the first anniversary of the armistice in 1919 two minutes’ silence was instituted as part of the main commemorative ceremony at the new Cenotaph in London. The silence was proposed by Australian journalist Edward Honey, who was working in Fleet Street. At about the same time, a South African statesman made a similar proposal to the British Cabinet, which endorsed it. King George V personally requested all the people of the British Empire to suspend normal activities for two minutes on the hour of the armistice “which stayed the worldwide carnage of the four preceding years and marked the victory of Right and Freedom”. 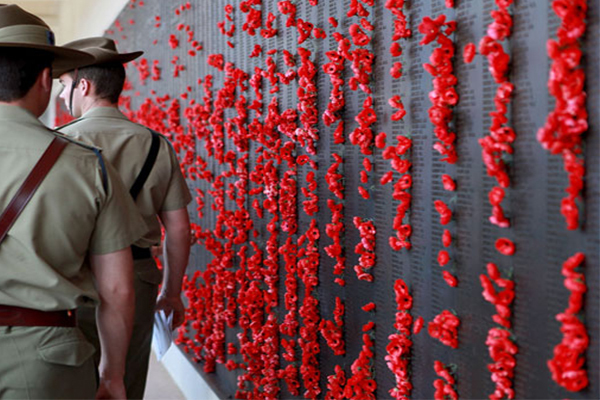 The two minutes’ silence was popularly adopted and it became a central feature of commemorations on Armistice Day.